Hearing loss is unique to each individual, even for those that share the same degree and type of impairment. Solutions for treating individual hearing loss can be as varied as the problem. 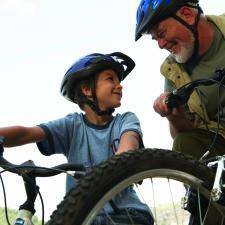 Fortunately, hearing technologies and treatments have advanced dramatically over the years. This is due, in part, to better trained and experienced professionals, but it is also the result of fast moving advances in hearing treatments and technology. The following is a list of technologies and techniques that can help people with hearing loss communicate and engage with their world. Hearing aids are precise and advanced instruments worn in or behind the ears. They not only raise the volume on sounds, but thanks to technologies like directional microphones they can focus on specific sounds, like your spouse speaking. Directional microphones work best in closer proximity to the speaker, so today’s digital hearing aids interact with personal FM systems, Bluetooth technology, and the T-coil; all of which target the speaker in larger rooms-- auditoriums, airports, classrooms, or boardrooms. Personal FM Systems use a microphone worn or placed by the speaker—say in a boardroom or classroom that transmits directly to a receiver that relates the signal to the hearing aid (HA). This means that the subject under discussion is heard without background noise. FM devices of today are smaller and more manageable than the devices of the past. FM devices of today are smaller and more manageable than the devices of the past. Bluetooth technology is the most recent advance in hearing aids. Bluetooth uses radio frequencies to allow devices to communicate wirelessly. Bluetooth communicates with a device that streams information to hearing aids. This device, usually an added expense, can be synced with ipods, televisions, GPS, and computers to name a few. All landlines and many cell phones are designed to interact with T-coils. Cochlear (kok-lee-er) Implant is a surgically implanted device that bypasses damaged hair cells to stimulate the auditory hearing nerve whenever sound waves are detected. Cochlear implants have internal parts (receiver and electrodes placed under the skin behind the ear) and external parts (microphone, transmitter, and speech processor typically worn behind the ear like a traditional hearing aid). Lip reading or speech reading is a linguistic exercise that once mastered strengthens communication abilities. This technique requires an individual to pay strict attention to the physical forming of words on the lips of a speaker. Special training can improve the success of this assistive listening technique. Today, more than ever, hearing aid users report higher satisfaction with listening technologies. Progress continues to be made in new technologies. These new advances, digital and otherwise, will make sure hard of hearing people can confidently rely on their sense of hearing when in private or a busy public area.